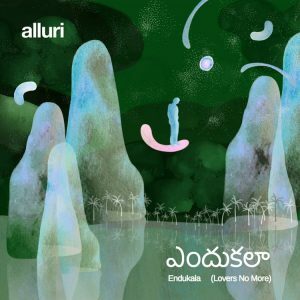 If you’ve ever fancied learning Telugu – an Indian language similar to Italian (allegedly) – then here’s your chance, as Hyderabad’s Alluri releases the kitsch cat-fight visuals for his second single, ‘Endukala’ (Lovers No More). The ‘happy break up song’ combines simple lyrics and melodies with a euphoric brass section, giving the track a retro feel, and signalling a new, larger sound for the Indian born artist. Alluri absorbed classical music in his teens before learning guitar and bingeing on the likes of Doves and Morrissey during his UK studies. Now working between India, the UK and Italy, he’s teamed up with Muse producer/mixer, Tommasso Colliva, and Italian musician, Massimo Martelotta, from cult ‘cinematic Italo-funk’ band Calibro 35, on this powerful and unique music sung in the local Telugu language of Hyderabad. ‘Endukala’ follows on from 2016’s ‘Evari Kosam’, and after spending the summer recording a new album entirely in Telugu, with Colliva and Martelotta, Alluri formed a new touring band with the artists who feature on the album, performing in London and at The Cambridge Folk Festival in August 2017. Alluri returns to London on November 7th to play The Islington. Redd Alluri’s tale is a fascinating one. He never heard any western music when growing up in Hyderabad, the capital of Telangana state in Southern India, instead being force-fed endless Tollywood – a regional version of Bollywood. His moment of enlightenment came, finally, when his older brother returned home after finishing university, bringing the classic rock of Guns’N’Roses with him. This was the path that led Alluri to, randomly, Ricky Gervais’ XFM podcasts. From there he was off: introduced to the wonders of The Smiths, Nick Cave, Joy Division and The Cure, and eventually making the leap to the UK, where he’s now based. ‘Man Of Truth’ was recorded in Brighton and sounds a lot like the brighter moments of late 1990s Britpop. Key track ‘All The Women’ has a brilliantly caustic lyric about, seemingly, the politics back home, and sounds both fiery and vital. ‘It’s With You’, meanwhile, is underpinned by a neat Kinks-influenced riff.